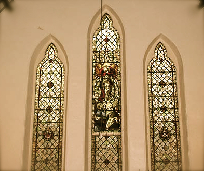 At the end of the 19th century, the family of the local German factory owner Delius donated three stained glass windows to the German Lutheran church. The composer Frederick Delius was descended from this family. The German congregation in Bradford has opened up its church for wider use - not only for religious services by other communities, such as the Latvian Lutherans, but also for the arts. Nowadays art exhibitions and concerts are regularly held there.